Estrade Media Pte. Singapore, recently hosted the 3rd Estrade Real Estate Conclave & Awards 2017 – Singapore, which was scheduled on 6th October 2017 at the Grand Copthorne – Waterfront. 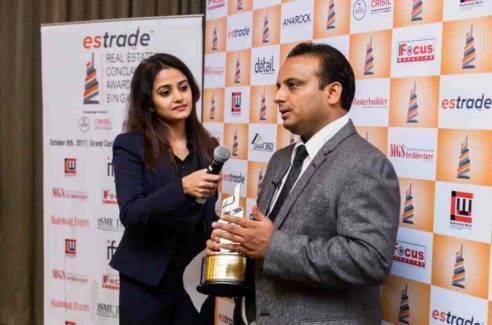 The Estrade Real Estate Conclave and Awards is the only India focused, business to business connect engagement for the Real Estate industry organized in South East Asia. The awards night brings together more than 100 business leaders comprising of Real Estate developers, Interior Designers and Architects. Unlike other industry engagements organized in India, where the connect is more local, Estrade Real Estate Conclave provides a global connect at an international platform. Nahar Group’s Excalibur project won the Most Admired Upcoming Luxury Project Award. Team Estrade had the opportunity to speak to man behind Excalibur, Architect Ajay Nahar, Partner – Nahar Group, Chairman & MD – Nahar Projects at the 3rd Estrade Conclave and Awards 2017 in Singapore. Following are the excerpts of this interview. 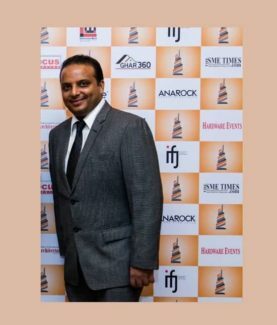 He is a graduate from the Academy of Architecture, Mumbai with a master’s degree in Construction Project Management from UCE, Birmingham (U.K.) His firm operational since 2001 specializes in providing the state-of-the-art management and coordination expertise and continues to add a dynamism to the Group with a multi – faceted role of a developer, planner and designer with ingenuity, skill, quality management and an eye for detail. Ajay has established a strong base for a futuristic growth in the construction industry by delivering projects that are redefining the face of luxury in the city. In a short span of its existence, Nahar Projects has successfully completed a varied range of developments such as hospitals, Medical centers, luxury residences, high rises, institutional buildings, business centers, farmhouses and more. He is also a vocal citizen with strong views on cities infrastructure and ideologies in the construction industry and has written several articles in media and been panellists on several platforms relating to architecture and the building industry. How do you feel on receiving the award? I feel great, thank you! How do you see the real estate market poised in India this year? We have been witnessing series of radical and transformational reforms – Demonetisation, Real Estate Regulator Bill (RERA), FDI relaxations, GST, Benami Transactions (Prohibition) Amendment Act, Change in Accounting standards IFRS – all coming in a row and in quick succession. Obviously, the year 2017-18 will see the Indian real estate sector to be still more transparent, credible and attractive with only organised players on the ground. With home ownership always being a priority ambition and investment objective for all Indians, these reforms will have very positive implications for the home buyers as well as residential real estate sector. Buyers are going to have the best time in 2017-18. Your views on the ever changing real estate industry? There are several factors are bringing in positive changes in the real estate industry especially if we speak about India- Positive economic growth has also led to a rise in disposable income among young executives, and this subsequently leads to growing aspirations in real estate. Government policies today are more proactive than ever before, and they eminently support the home purchase rationale. Fiscal incentives like falling interest rates now make investment in residential properties even more attractive. On the back of a growing economy, the growth of the country’s affluent class has been a strong driver for the demand of luxury housing. Another important factor positively influencing housing demand in India has been the rapid increase in double income families..
What are your thoughts in RERA and GST? The implementation of the law has reinforced consumers’ trust in the sector as it has brought transparency in real estate transactions, safeguarding the interest of the homebuyers along with timely completion. Home buyers are feeling safer hence; it is expected to bring positive sentiments in the sector. With the implementation of the Act, we have witnessed faster turnaround of under construction projects and project discipline shall be more pronounced which will provide the much needed momentum. The GST is the single-biggest tax reform to be ever introduced in India. GST aims at eliminating the difference in indirect taxes applicable across various states. How do you see the future of real estate market in India? The downside is over and much required ‘correction’ has come due to RERA, GST and demonetization effect. With several funding are available like NDIT – NRI investment is likely to revive the real estate market. I believe this factors will help India’s property market sales to grow at a 14% compound annual rate from 2017-20 and 18% from 2020-25. What’s your view on the RERA? The implementation of the law have reinforced consumers’ trust in the sector as it has brought transparency in real estate transactions, safeguarding the interest of the homebuyers along with timely completion. Home buyers are going to feel safer hence; it is expected to bring positive sentiments in the sector. The biggest dampening factor in real estate sector from some years has been lack of trust in the home buyers’ mind which has led to postponement of purchase decision. With the implementation of the Act, we shall witness faster turnaround of under construction projects and project discipline shall be more pronounced which will provide the much needed momentum. We are anyways seeing a surge in sale of ready to move units. Inflow of FDI is also expected to grow at project level. To get the velocity back into the sector, it is pertinent that the turnaround of sentiment and RERA shall pose as an important catalyst towards meeting this objective. How introduction of RERA is set to change the future of Real Estate market in India? REIT and FDI, which will dominate the market for Real Estate and Infra projects over next 2 years? I feel Privatization will lead to better FDI Policies. Privatization will lead to greater inflow of foreign investments and encourage domestic players in sectors. For e.g. JVK has developed Chatrapati Shivaji International Airport, Mumbai is renowned name in the word. Which segment, Real Estate commercial or infra, do you think will contribute maximum, in revenue terms, over the next 2 years? The Indian real estate sector has witnessed high growth in recent times with the rise in demand for commercial as well as residential spaces. The real estate sector in India is expected to attract investments worth US$ 7 billion in 2017, which will rise further to US$ 10 billion by 2020. As looking to data I feel the commercial will attract maximum contribution. Affordable housing is commercially viable? This is product going to dominate the market nationally? Affordable housing is at the center stage of India’s real estate movement and this story is likely to unfold for multiple years. In my opinion there has already been a significant surge in affordable housing projects across eight major cities. The government’s financial and policy thrust, regulatory support, rising urbanization, and increasing affordability is converting demand for affordable homes into a commercially viable opportunity. The sun is finally rising on the affordable housing segment. There has been way too much stress on luxurious lifestyle in real estate marketing, is this set to change? In Luxury Project media buying is very expensive. Developers are shifting toward doing barter with media house to save on the liquidity of the firm. Rapid Globalization has also led to seamless inflow of global lifestyle trends which add to the cost. This spike in demand has made most developers think of new ideas and innovative plans in luxurious lifestyle in real estate marketing in coming years. What are the key changes that the Government must do in policy and permissions terms? Reduce tax burden on the end user , One window clearance is still the need of hour, If builders get approvals smoothly it will help to build smoothly and efficiently as well. MCGM should be more speedy and preferred to do Online procedure. Is the industry facing shortage of skills? Which areas? How are the Real Estate players bridging this gap? Cities Infrastructure , climatic conditions doesn’t allow for half a year for city to grow. Need to smooth logistics and ground work should be on priority basis. Real Estate bridge this gap by setting small targets at a time and achieve and grow more efficiently. System like STP , Waste management are implemented to bridge the gap. How do you think realty firms would benefit from government’s flagship schemes such as ‘Housing for All by 2022’ and ‘100 Smart Cities’? The government has granted the much-coveted infrastructure status to affordable housing, giving developers access to cheaper sources of funding, including external commercial borrowings (ECBs). Affordable housing promoters have been granted more time for project completion – the deadline has been increased to five years from the current three years. Developers will get a year’s time to pay tax on notional rental income on completed but unsold units. The tenure for long-term capital gains for affordable housing has been reduced from three to two years. The qualifying criteria for affordable housing have been revised to 30 square meters and 60 square meters on the carpet, rather than the saleable area, for metros and non-metros respectively. This effectively increases the size of the affordable housing market across India. Do you see correction in property prices? RERA will play a fundamental role in determining the economic framework of demand and supply in the real estate industry. While the new rules call for a much stricter compliance and transparency, which may push the real estate prices up especially for the new launches, the large amount of inventory overhang in the system, will probably keep the price rise at bay till the supply gets over. There will be more end-users in the market, as consumers’ confidence in developers is a critical component of market sentiment and these are the primary beneficiaries of greater transparency. These end users will largely hail from the middle-income and low-income categories who will look closely at affordable housing. What kind of projects are getting funding from investors these days? Project who have small ticket sizes fetch more investors, Projects which have 1 and 2 BHK homes and commercial project which have small sizes of office spaces. How is the outlook on Residential property over the next 1 year? Demand for residential property expected to grow sharply over next 1 year. A localised, fragmented market presents Opportunities for consolidation; more foreign players might enter the market as FDI norms have ease. Furthermore, norms on land acquisitions are expected to be relaxed. As due to huge demand developers now focussing on affordable & mid range categories. In the next two years, what are the two trends that will define the future of the industry? Timely delivery of projects and transperancy.